Let me warn you this is going to be a super long posts as I'll try to share with you all the memories I have from this trip and I'd also like to keep this as something I can look back and cherish in the future. February 19 2017, I finally landed in Seoul, Korea after being picked by Charis as one of the contestant to join their Beautiful Journey in Seoul part 2. It was indeed one of the most memorable times in my life, as its also my first time travelling abroad without my families. 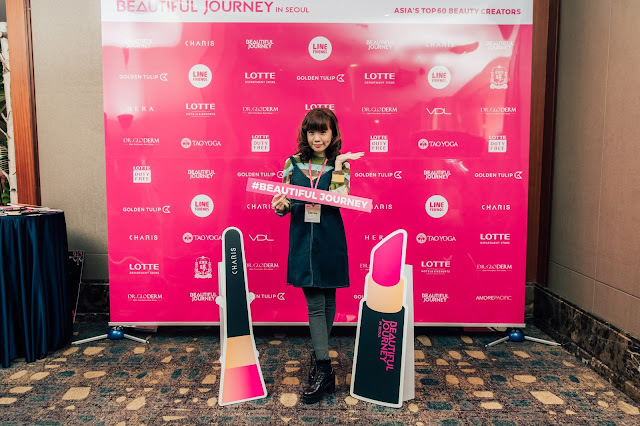 It was kind of scary but at the same time very exciting cause I know I will have lots of fun and meet lots of inspiring people from across Asia who share the same interest as me. On our way to the Van It was freezing cold, the wind was so strong but thankfully I'm all bundled up ready for the situation although I'm dressed for the weather but I'm just mentally not prepared for it. Didn't expect the weather to be that cold, hahahaha after arriving on our van we're off to our hotel that is Lotte Hotel Seoul Myeongdong. The ride was about 1 hour from Incheon Airport to Myeongdong, the view from the window seat wasn't bad either I had a good time seeing the city scape before we're surrounded by concretes jungle and the one hour ride doesn't feel that long. Arriving at the hotel we're asked to move to the 33rd floor as our check-in will be there and that's when I finally meet Livia, she has helped me a lot throughout my whole trip in Korea as well as prior to the trip while preparing the whole trip from visa to my flight. 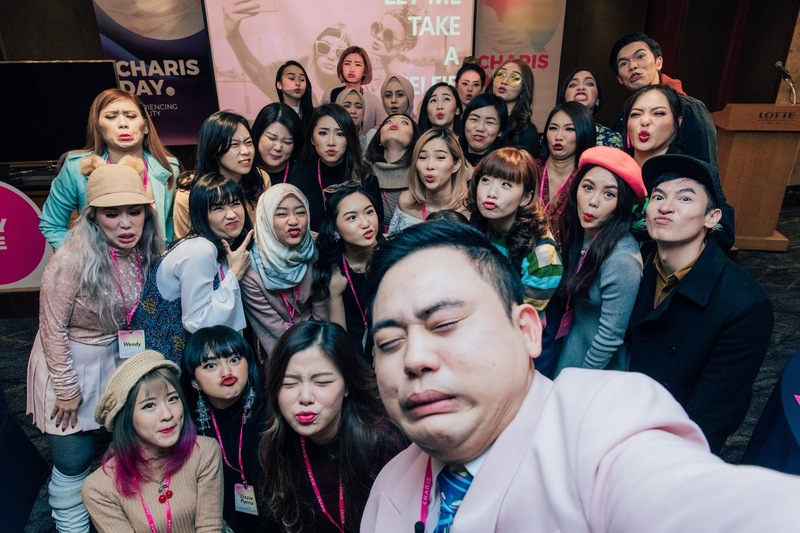 The whole Charis team are so welcoming and they could be awarded as the best host one can ever ask for, everyone is very warm and friendly! I kind of miss them while writing this down.. Some of them were like brothers and sisters to me cause they made it seem like its not the first time we met and we've all known one another for a very long time.They made sure everything is right so that we can all have a pleasant and comfortable stay during our trip. In my room A pink box is waiting for me, in the box it says about our gala dinner which is the only schedule for day one, so some of us took a rest while I decided to meet up with my friend and explore the city a bit. Will talk more about what I did on my free time on another post. Let's fast forward, it was 7 pm and its finally time for the dinner where we'll meet new friends from different countries some are from Singapore, Malaysia, Vietnam, Philippine, Thailand, China, Taiwan and us Indonesia! The dinner took place at the Grevin Museum Seoul which is located just across our hotel. However the weather wasn't very good as it continued to rain at night and we're all given raincoats to cross the road (Love how they carefully planned and looked after tiny details like these). Fast forward the night ends and we all rested... Before hitting the bed I actually spend sometime opening up another pink box that is already inside my room when I arrived. It has been raining presents throughout my Charis Beautiful Journey and the sweetest thing is to find a card filled with notes inside telling us about our next itinerary. 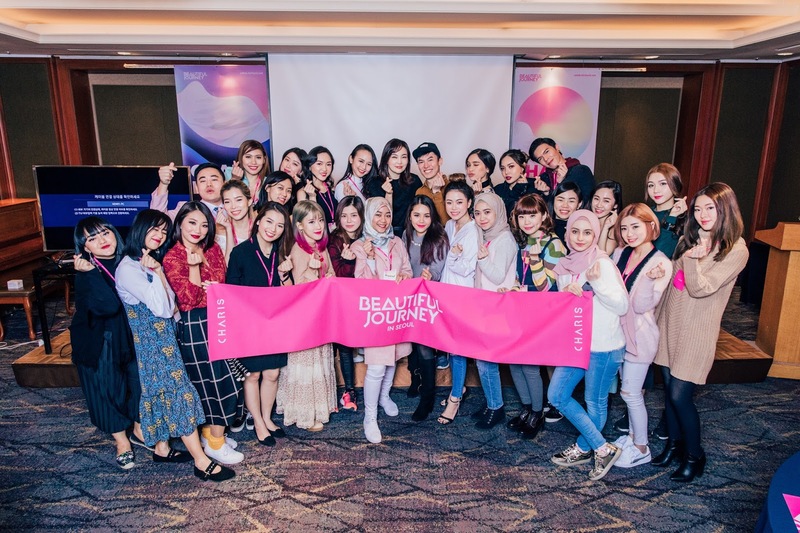 Day 2 is like the official start of the Beautiful Journey as it's Charis day a day filled with our makeup classes and various products trials. It was by far the most fun and exciting day as there are tons of beauty products for us to try out and not to forget they are all available for us to take home. They have surely made every girls dream come true, really spoiled us way too much! Look at all those sponsors for this event ! The day started with Andy explaining about Charis and their business nature as well as their hopes to connect creator from across South East Asia and to help us build friendship among creators. 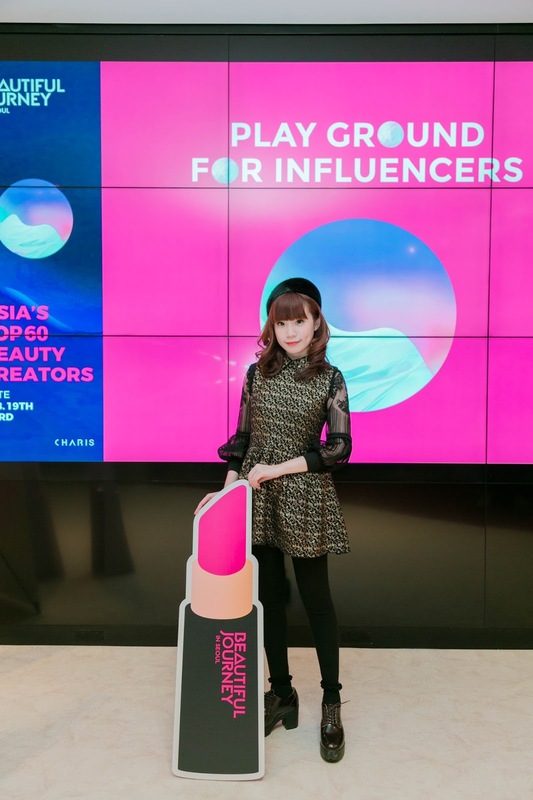 I am super blessed to be in the same room with different top influencers and content creators from various countries, as I myself have only started blogging last year and being in a room full of top influencers make me feel that this is not a privilege everyone can experience but its also a drive that motivates me to be able to one day grow as influential as those in the room but still very humble! Glad that even though most of them are already top creators/ influencers but they are all still very friendly, down to earth and welcoming. Speaking of which made me made couple new friends from Malaysia, Philippines, Vietnam, Thailand and Singapore. Lunch at the most dreamy place ever! 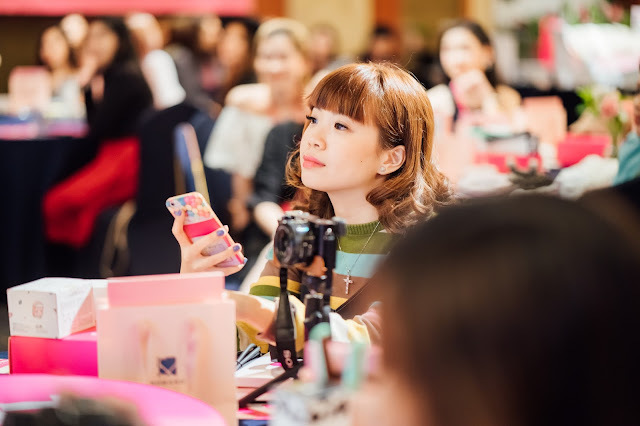 The beauty class was hosted by one of Korea's top Makeup Artist Seo Sujin as she explained the main key for Korean makeup, she told us that the two most important part are eyebrows and the healthy youthful skin look. After a long day, we're finally off to one of Korea's BBQ restaurant!! Unlimited booze were served together with the super yummy fried chicken as we ate the infamous Korean Chimaek (Chicken and Maekju which means beer). The Chicken in Korea surely deserves the shout out as they taste super delicious with a crunchy skin but very juicy and tender meat. They serve both soju and beer as they mixed it to make the make the famous So-maek (Soju and Meakju). Cause I don't usually like alcohols so I skip the so-maek but instead tried a a sip of soju out of curiosity and guess what it's indeed not my kind of drinks hahahaha 😅😂 Didn't manage to take any picts not because it was a blurry night but I was enjoying the moment a little too much that I forget to document them! 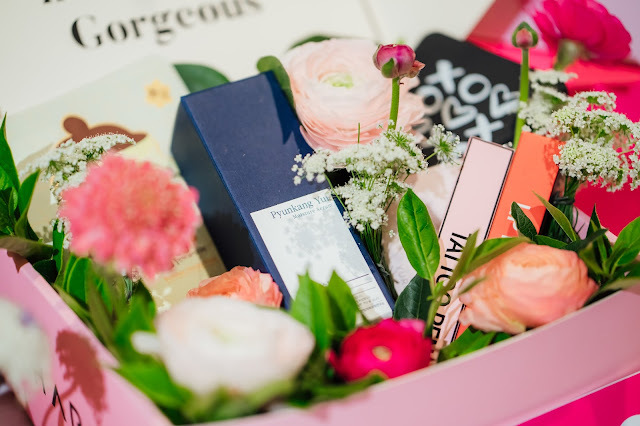 Charis Lucky Box batch two will soon be available so don't miss the chance to get them and get lots of best Korean beauty product at the most effective price! ( who know's you'll get more than you've paid) Stay tune for their updates on their social media! Must Visit Tourist Attractions in Tokyo-Japan ! !